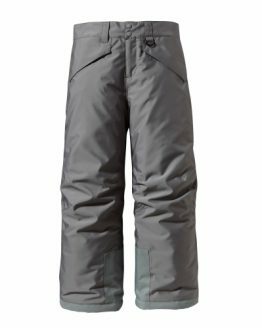 Patagonia premium ski/boarding pants for boys, the Snowshot Pants have an H2No™ Performance Standard 2-layer shell with a DWR (durable water repellent) finish that offers more mobility and less bulk. H2No™ Performance Standard shell: 2-layer, 4.4-oz 75-denier 100% polyester (45% recycled) mini-herringbone with a waterproof/breathable barrier. Insulation: 80-g Thermogreen™ 100% polyester (92% recycled). 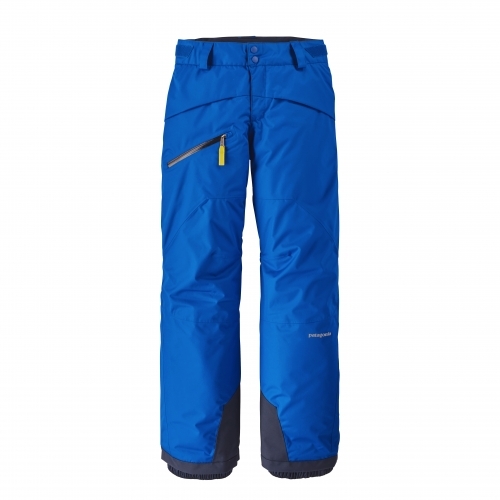 Patagonia Boys’ Snowshot Pants slice through Targhee’s snorkel-worthy pow and keep him toasty warm on the chair back up. Outfitted with an H2No™ Performance Standard shell with a waterproof/breathable barrier, the snow/ski pants have a DWR (durable water repellent) finish and fully taped seams to keep him dry. 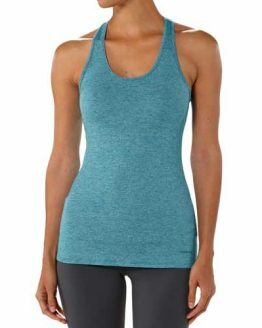 Insulated with 80-g Thermogreen™ polyester (92% recycled), which stays warm even when wet. The tricot-lined, contoured waistband adjusts externally with hook-and-loop side tabs. Two covered handwarmer pockets with hook-and-loop closure plus secure pocket on upper thigh (wearer’s right side) with waterproof zipper hold lunch money. Articulated knees maximize movement. Durable nylon scuff guards protect hem and inside pant leg while internal gaiter with gripper elastic fits over boot and keeps out cold. 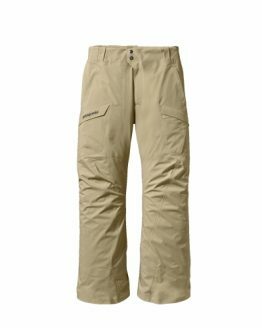 In additional, a tab inside each pant leg snaps into a loop on back of leg to keep cuffs off the ground when walking to and from the slopes. Grow-fit feature in legs increases length by two inches for extended wear. Reflective logo on front knee. Hand-me-down ID label..